8 Results exactly matching the search phrase. 49 Results matching titles words. 88 Results matching product descriptions. 53 Results matching title or description. The HDMI v1.3 to CAT6 Transmitter is designed to allow you to extend a HDMI signal over a long distance. Instead of using expensive HDMI cables, this unit distributes the signal over a CAT6 cable. When used with an appropriate CAT6 to HDMI Receiver unit, the Input/Output source can run up to 45 meters (1080p/8 bits). The HDMI/CAT6 to Single CAT6 Extender is an advanced solution for HDMI and CAT6 signal distribution. The CAT6 output port can be easily connected to CAT6 to HDMI receivers to allow a stable connection between an HDMI source and any compatible HDMI display, or, it can be cascaded to extend the signal to several hundred meters. The HDMI to CAT6 1 In 4 Out Splitter copies a single HDMI video/audio signal to three RJ-45 CAT6 outputs and an HDMI local output. The three individual CAT6 outputs then transmit the HDMI signal across dual CAT5e/6/7 cables up to a distance of 45m. When used with CAT6 to HDMI receivers, the unit provides a great way to link and display a single HDMI source to 4 different screens, simultaneously. The HDMI v1.3 1 In 8 Out CAT6 Distributor presents one HDMI video/audio source to one local HDMI output port and seven CAT5e/6/7 output cables, with transmission distances of up to 45m, without signal loss or degradation. When used with CAT6 to HDMI receivers, this unit provides a great way to link and display a single HDMI source to 8 different screens, simultaneously. The HDMI 1 In 8 Out Single CAT6 Splitter can distribute a single HDMI source to eight displays simultaneously, when connected with a CAT6 to HDMI receiver, by splitting and replicating the source signal. The HDBaseT-Lite 1x7 over HDMI and CAT5e/6/7 Splitter can split and distribute one (1) HDMI video and audio input into seven (7) CAT5e/6/7 outputs and one (1) HDMI bypass output. It supports video resolutions up to 1080p Full HD, UHD 4K×2K, all 3D formats and multi-channel digital audio formats such as LPCM 7.1CH, Dol-by TrueHD, Dolby Digital Plus and DTS-HD. The HDMI bypass output can be connected to an HDMI display for local monitoring, or cascaded to another splitter to increase outlets. The CAT5e/6/7 outputs can be connected to compatible CAT5e/6/7 to HDMI Receivers to extend the operating distance up to 60 meters with in-built PoC (Power Over Cable) functionality. ​The HDBaseT 1×8 HDMI over HDMI and CAT5e/6/7 Splitter with PoE/LAN can split and distribute a single HDMI input, 2-way IR control and LAN serving to up to seven CAT5e/6/7 outputs and includes a simultaneous HDMI bypass output. The CAT5e/6/7 outputs can be connected to CAT5e/6/7 to HDMI receivers to extend the operating distance up to 100 meters. 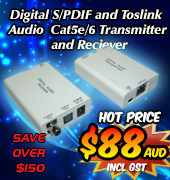 The CAT6 to HDMI v1.3 Receiver is designed to allow you to extend a HDMI signal over a long distance. Instead of using expensive HDMI cables, this unit distributes the signal over a CAT6 cable. When used with an appropriate HDMI to CAT6 Transmitter unit, the Input/Output source can run up to 45 meters (1080p/8 bits). 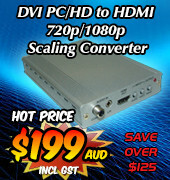 The HDMI v1.3 Over One CAT6 Receiver is a convenient way to extend a HDMI signal over a long distance. Instead of using expensive HDMI cables, this unit receives a HDMI signal over a CAT6 cable. Unlike similar products which distribute the CAT6 Video and DDC data along two separate CAT6 connections, this unit receives the Video and DDC Data along a single CAT6 Connection. 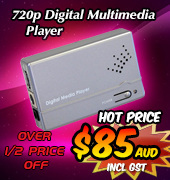 Advanced HDMI and Dolby Audio over single Cat5e/6/7 Receiver designed to receive HD video 1080p/Deep Colour and digital Dolby lossless audio up to a distance of 45m. Supports digital video formats in 'Deep Colour' mode at up to 36-bit(12-bit colour) and lossless digital audio formats like Dolby TrueHD, Dolby Digital Plus and DTS-HD MAster Audio. The received line signal can be optimised using a seven increment equalisation switch, to help compensate for different transmission cable distances. 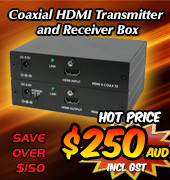 The HDMI and Dolby Audio over single Cat5e/6/7 Receiver is user friendly, easy to instal and operate. The HDMI v1.3 to Twin CAT6 Receiver Receiver takes a CAT6 Source and outputs to your connected display via HDMI. It is intended to be used with a HDMI to CAT6 Transmitter unit (eg ID#788), and allows you to extend a HDMI signal over a great distance. One benefit of using a CAT6 cable instead of other cables for long cable runs is its inexpensive price, making long cable runs more cost effective than ever before. The HDMI 4K 3D over CAT5e/6/7 Wall-plate Receiver terminates a CAT5e/6/7 cable pair up to 60m from the source and accepts HDMI video and audio signals up to 4K resolution and 3D formats. New HDBaseT-Lite HDMI over Single CAT5e/6/7 Transmitter and Receiver with IR/RS-232 is designed to support transmission of uncompressed 1080p, 3D and 4k2k Video, plus HD Audio, up to a distance of 60m without loss or degradation of the signal. Using HDBaseT-Lite technology for greater flexibility in design, installation and control of CAT5e/6 cable transmission systems, the HDBaseT-Lite HDMI over Single CAT5e/6/7 Transmitter and Receiver with IR/RS-232 makes setting-up easy and efficient. The HDMI over CAT Cable Transmitter & Receiver Set w/ 48V PoE & OAR transmits uncompressed audio, video and IP data over a single run of CAT5e/6/7 cable up to a distance of 60m. HDMI over CAT5e/6/7 Transmitter with bidirectional PoC receives uncompressed video and audio over a single pair of CAT5e/6/7 wires for a distance up to 60m. The HDBaseT-Lite HDMI over CAT5e/6/7 with PoE Transmitter and Receiver transmits uncompressed video and audio over a single CAT5e/6/7 cable up to a distance of 60m (HD 1080p) or 35m (Ultra HD 4Kx2K). The CAT5e/6/7 receiver is Power over Ethernet (PoE) compatible, enabling it to be powered from the source end CAT5e/6/7 transmitter. New HDMI 4K with LAN over CAT5e/6/7 Receiver terminates a single pair of CAT5e/6/7 wires up to a distance of 100m from the source and receives uncompressed HDMI HD 1080p, UHD 4K2K and 3D format video, audio and IP data. ​The HDBaseT HDMI over CAT5e/6 Transmitter & Receiver w/dual PoE sends and receives uncompressed High Definition video and audio signals over a single run of CAT5e/6 cable, up to a distance of 100m (382ft). Incorporating HDBaseT 5Play convergence technology for Video, Audio, LAN, Control (IR & RS-232) and Power over Ethernet (PoE) this compact and efficient video/audio transmission system is perfect for installations that need adaptability and versatility. The HDMI over single CAT5e/6/7 Transmitter and Receiver set is designed to extend uncompressed audio/video and IP data over a single run of CAT5e/6/7 cable up to a distance of 100 meters. The HDBaseT HDMI & IR over single CAT5e/6 Transmitter and Receiver is a pair of devices that transmit and receive uncompressed Video and Audio (up to 1080p @ 60Hz 8/10/12 bit deep colour video) over a single CAT6 cable up to a distance of 100m, or 80 meters via cat5e cable. Supports HDMI v1.4 and 3D (40m), 4k2k (20m), HDCP & DVI compliant, with 3Play convergence: HDMI & Control (IR & RS-232). The HDMI over CAT5e/6/7 Receiver with 48V PoH receives uncompressed audio/video and IP data over one single pair of a CAT5e/6/7 cable, for up to a distance of 60m. The HDBaseT HDMI over CAT5e/6/7 Wallplate Receiver with 24vPoC and LAN Serving is designed to receive uncompressed video, audio and IR control data from a compatible transmitter over a single run of CAT5e/6/7 cable up to a distance of 100 meters. The HDBaseT-lite HDMI over Cat5e/6/7 Transmitter and Receiver can send and receive uncompressed audio and video from an HDMI signal source simultaneously over a single run of CAT5e/6 cable to an HDMI display. The transmitter/receiver set can transmit data over a distance of up to 60m, and has the added benefit of control through the built-in RS-232 and infrared ports. The HDBaseT HDMI/IR/RS-232/PoE to CAT5e/6/7 Receiver (to be used in conjunction with the transmitter - #783) makes your home or office more efficient by transmitting and receiving uncompressed HDMI video and audio signals up to a distance of 100 meters. You can control signalling which can be utilised on the HDBaseT HDMI/IR/RS-232/PoE to CAT5e/6/7 Transmitter (with the receiver) through the built-in RS-232 and IR ports over 100 meters.